Organization owners and team maintainers can give teams admin, read, or write access to organization repositories. Organization members can send a notification to an entire team by mentioning the team's name. Organization members can also send a notification to an entire team by requesting a review from that team. Organization members can request reviews from specific teams with read access to the repository where the pull request is opened. Teams can be designated as owners of certain types or areas of code in a CODEOWNERS file. You can also use LDAP Sync to synchronize your GitHub Enterprise instance team members and team roles against your established LDAP groups. This lets you establish role-based access control for users from your LDAP server instead of manually within your GitHub Enterprise instance. For more information, see "Enabling LDAP Sync." 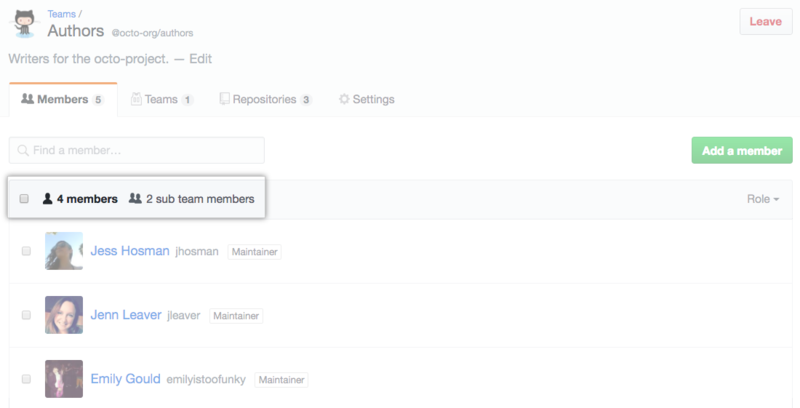 You can reflect your group or company's hierarchy within your GitHub Enterprise organization with multiple levels of nested teams. A parent team can have multiple child teams, while each child team only has one parent team. You cannot nest secret teams. Child teams inherit the parent's access permissions, simplifying permissions management for large groups. Members of child teams also receive notifications when the parent team is @mentioned, simplifying communication with multiple groups of people. For example, if your team structure is Employees > Engineering > Application Engineering > Identity, granting Engineering write access to a repository means Application Engineering and Identity also get that access. If you @mention the Identity Team or any team at the bottom of the organization hierarchy, they're the only ones who will receive a notification. To easily understand who shares a parent team's permissions and mentions, you can see all of the members of a parent team's child teams on the Members tab of the parent team's page. Members of a child team are not direct members of the parent team. As part of its optimization configuration, LDAP Sync will not transfer your nested team structure. To create child and parent team relationships, you must manually recreate the nested team structure and sync it with the corresponding LDAP group. For more information, see "Creating teams"
If your organization already has existing teams, you should audit each team's repository access permissions before you nest teams above or below it. You should also consider the new structure you'd like to implement for your organization. At the top of the team hierarchy, you should give parent teams repository access permissions that are safe for every member of the parent team and its child teams. As you move toward the bottom of the hierarchy, you can grant child teams additional, more granular access to more sensitive repositories.